On Friday night Eric and I had a real date night- the first one since February, I think. (Thanks Megumi for watching the kids!). We went to our favorite Italian restaurant, and then to Eric’s movie pick — Die Hard 4. We loved watching the previews and seeing what is coming out soon in Japan theatres. The big movie coming up is called “Transformers”, a sci-fi thriller about two robotic clans at war. The movie has probably already been popular in the US– we’re pretty sure its going to be huge when it comes to Japan in August. (Not on my list for our next date night, however). What movie would you most want them to make a sequel for? 3) read together a section of the word several times (yesterday: Colossians 1:1-14); ask if there are any questions…then spend 5-10 minutes silently re-reading the passage and asking the Spirit to speak to our hearts what we need to learn. 4) We break into small groups and share what has been impressed on us. Eric takes the elementary and jr. high kids to another room and leads their discussion time. 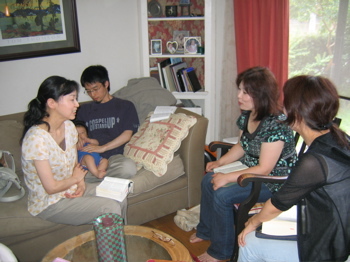 5) We pray together for any specific needs shared within the small group. 6) We have lunch and enjoy fellowship together. Usually, house church is much more than a one-hour service: it is 4 hours or so of worship, prayer, and sharing our lives together. Yesterday was a normal house church day. We of course were scurrying in the morning to get lunch made before everyone arrived, clean up breakfast and our house, dress the kids. Owen and Annie seemed more needy than usual during the worship time — I was jumping up a lot to either discipline or keep Olivia from getting into something she shouldn’t, all the while trying to participate in our small group discussion of Colossians. Then serving lunch and drinks. Then lots of discussion about the upcoming team coming from LA to minister with us in early August. By the time everyone left at 3:00, Eric and I felt like we could just go to bed and sleep for 2 days (funny- we feel that a lot these days!). And then I started to think about what really happened. In my group of four, we had one husband, “George”. His wife is a believer; he is not yet. 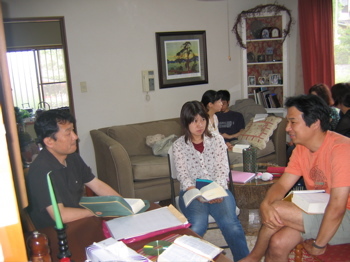 He has been studying English in Eric’s men’s class, and slowly showing more interest in the Gospel. He came, and just kept reading the passage over and over. He shared how he wants to learn more about the Bible. He was intrigued by our comments and Paul’s life. His wife Aiko shared challenges they are having with two children, one of whom dropped out of school three years ago– in fifth grade– and hasn’t been back since. The third member, after we all shared, asked me to pray for this couple and their family situation. As I prayed, Aiko cried through the whole thing. She and I had both been impressed with Colossians 1:11 “…may you be prepared to endure everything with patience, while joyfully giving thanks to the Father.”… It’s one thing to endure with patience…but to have patience with JOY — surely this can happen only with the divine help of the Holy Spirit! I prayed this for George and Aiko. As we finished up, I noticed the other group was praying…and that three of them had laid hands on one of the women, who’s shoulders were shaking as she cried. Transformation. Eric later told me that one of the fifth grade girls had shared a story that she was being harassed at school by some boys. That night, she prayed and asked Jesus to take care of her and stop the boys. The next day -and the days that followed — she was no longer harassed. They left her alone. The Spirit at work — she saw that it is REAL. And she is more of a believer. As I thought back about those four hours, I felt a sense of joy. Tiredness – but joy! It’s not that I think there needs to be a lot of mushy-type crying at church. But I realized that what was happening on Sunday is that God was at work doing what He does best- transforming lives. Our house church might be small (14 or so) as most would measure church, but it is growing…and I think it’s growing because God is at work transforming people. I’m in the life change business. I’m in the transformation business. You know what motivates me? – not size; in fact, I don’t even like big churches. I mean, my favorite size was 300 people. What motivates me is that I am addicted to changing lives. I love seeing lives changed and that is the untold story. Everybody tries to attribute the growth of churches to everything else but what makes them grow – and it’s changed lives. Its happening here in Sanda. And around the world. Church – the best transformer.